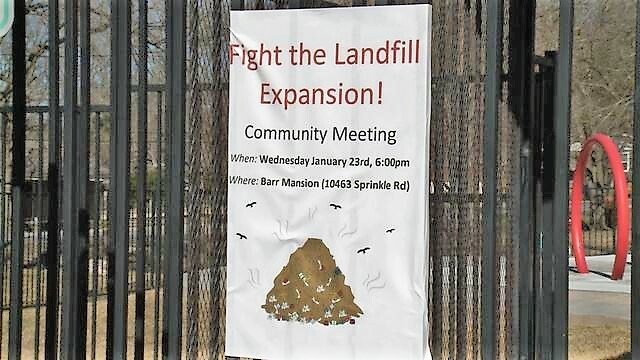 AUSTIN (KXAN) — Wednesday, people living in Northeast Austin and Travis County gathered at Barr Mansion to align their vision for stopping an expansion of the Austin Community Landfill. Residents nearby have complained of strong smells from the landfill, as well as buzzards circling and large feral hogs running around. But more recently, they have started to mobilize with concern about the long-term health and environmental impacts of the contents at the landfill. The Austin Community Landfill (ACL) is in Northeast Travis County off of Highway 290 and has been used as a landfill since around 1970. The site has been owned by a company called Waste Management since the 1980s. 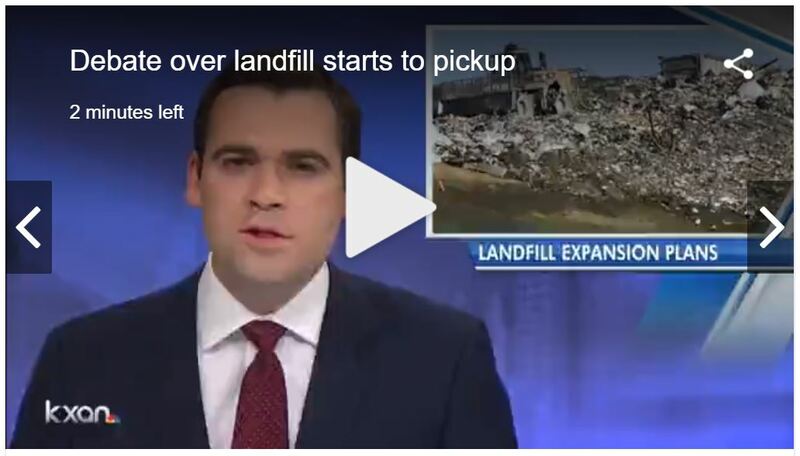 It’s no secret that Waste Management is looking to expand the ACL landfill, they estimate there is enough space left currently to last for another six to eight years. Colleen Mikeska, a resident of the nearby Colonial Place neighborhood, planned to attend the meeting Wednesday. Mikeska moved into the neighborhood a year and a half ago, she grew up in Austin and chose to move there because it was one of the last “affordable-ish” neighborhoods she could find. Mikeska knew the landfill was there when she moved and even said her son was entertained by the buzzards flying overhead, but she grew concerned in the fall of 2018 when she learned of the possibility that the landfill might expand. She grew even more worried when she learned about the history of what had been disposed of there. “Every once in a while it smells really bad, a lot of the time it doesn’t, but sometimes it does, and it seems to have gotten more frequent in the last six months,” she said. A consulting report from 2003 shows that Industrial Waste Materials Management was allowed to dispose of liquid and drums of waste at ACL in the 1970’s, materials which would be considered hazardous by current standards. The consulting report calculated that more than 19,000 tons of industrial/ hazardous waste were disposed of by IWMM in unlined pits at ACL. “It doesn’t take a scientist to know it’s not healthy to be surrounded by toxic chemicals all the time,” Mikeska said. She wonders if the contents of the landfill could have long-term consequences for her or her family. Mikeska learned about the efforts to expand the landfill through the Texas Campaign for the Environment, a non-profit which works on health and environmental issues. Andrew Dobbs, the program director for the Texas Campaign for the Environment, said his organization has been looking into health and environmental concerns tied to this landfill for more than a decade. “Most of what we have can stay out of the landfills if we compost and recycle, reuse the way that we know we can and should, there’s no reason why facilities like this should continue,” he said of the ACL landfill. His organization has been involved with neighborhood groups to oppose the landfill expansion. Dobbs said the goal is to stop Waste Management from getting an expansion permit from the state, then to make a remediation plan for the pollution on site. “There are thousands and thousands of hazardous industrial waste on-site underground there, and this is something that we’re going to have to clean up sooner or later, we’re hoping that it will be sooner,” he said. Back in 1982, Tom Clark with the U.S. Environmental Protection Agency called the landfill Austin’s Love Canal, comparing the industrial waste site at the ACL to the landfill in a Niagra Falls neighborhood where hazardous waste led to a pollution and health disaster. Lisa Doughty, a spokesperson for Waste Management in Texas, explained that her company is in the early stages of researching for the expansion, a process which they expect to take three to five years. She added that Waste Management has processes in place to address odors at the ACL landfill, including driving the area several times a day, monitoring wind direction through their weather station and covering smelly loads right away with dirt. Additionally, Waste management has stopped taking the more “odorous loads” to the ACL landfill including sludges, she said. She also noted that the landfill is highly regulated and monitored by the Environmental Protection Agency and the Texas Commission on Environmental Quality. “No one wants a landfill in their backyard it’s understandable,” said Richard McHale is the assistant director for Austin Resource Recovery, the branch of the city of Austin focused on collecting and finding ways to reuse waste. He explained that the city of Austin uses two landfills. The majority of the city’s waste goes to the Creedmoor Landfill south of Austin, including residential, curbside trash. McHale said only waste from city facilities and a small residential dumpster contract the city maintains is sent to ACL, a much smaller percentage of the city’s waste. He added that Austin has had “no issues” in the past with the health or safety standards at the ACL landfill. “We’ve looked into issues that have been brought up, we’ve contacted EPA about any issues with us having liability and they’ve told us there’s no issue at this point,” McHale said. McHale explained that there’s been a recent change to Austin Resource Recovery’s “matrix” or method for prioritizing which landfills it sends waste too. Under this new change, he said it’s possible that the city could send more waste to the ACL landfill, but it’s also possible the city could send less. That would depend on the contracts that come up for approval through the city council, he said. Additionally, he said the landfill matrix is a new tool and it’s likely there will be some changes in the future. KXAN told McHale about some of the worries residents near ACL landfill have expressed. “If those issues are occurring, we encourage folks to contact the Texas Commission on Environmental Quality to make complaints with them,” he said. McHale added that the state regulates permitting and expansion for landfills like ACL. “We need to be working towards zero waste, not just expanding a huge dump,” Mikeska added. She plans to keep speaking up, and said many of her neighbors will too.